Happy Birthday to me! And what's a birthday without cake? I'm absolutely in love with this cake. 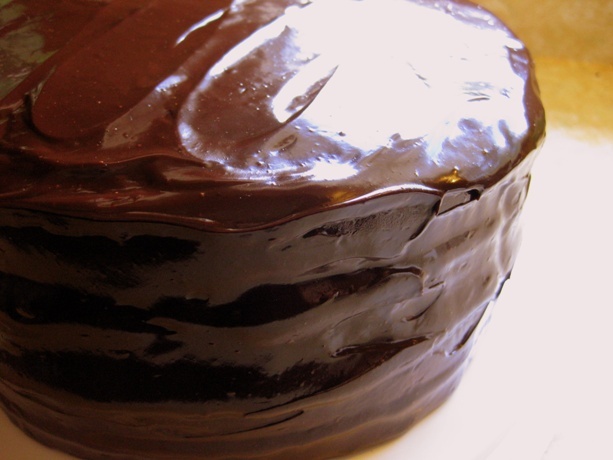 It is moist and rich and chocolate heaven. 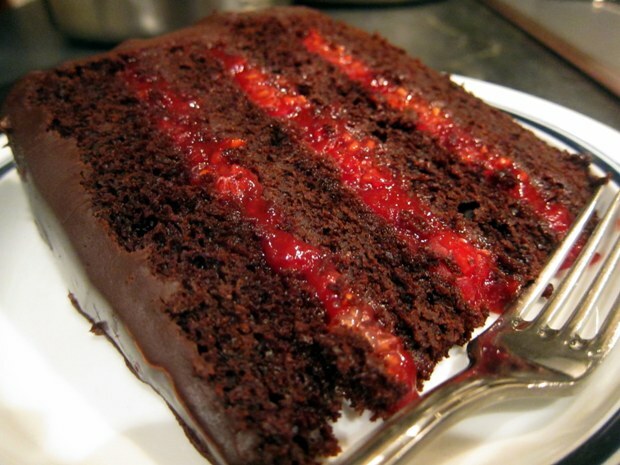 Chocolate and raspberry is always a perfect combination. I love how the raspberries cut the sweetness of the chocolate in this cake and the chocolate ganache frosting, tastes like you're eating a truffle. Mmmmm...yum. Now I won't lie to you, this cake involves some work/time but its worth all the effort. I would be a very happy Dragon if I had this cake for my birthday every year. :) Enjoy! 1. Preheat oven to 350F. Butter and flour 2 nine inch round cake pans. 2. Combine chocolate and hot coffee in a bowl. Let mixture stand, stirring occasionally, until chocolate is melted and mixture is smooth. 3. Into a large bowl sift together sugar, flour, cocoa powder, baking soda, baking powder, and salt. 4. In a separate large bowl with an electric mixer beat eggs until thickened slightly and lemon colored (about 3 minutes with a standing mixer or 5 minutes with a hand-held mixer). 5. Slowly add butter, cream, milk, sour cream, vanilla, and melted chocolate/coffee mixture to eggs. Beat until combined well. 6. Add the dry ingredients in halfs and beat on low speed until just combined. Don't over mix. 7. Divide batter between the two prepared pans and bake in middle of oven until a tester inserted in center comes out clean, 45-50 minutes. 8. Cool layers in pans for about 10 minutes. Run a thin knife around edges of pans and invert layers onto racks. Allow the cake layers to cool completely. Cake layers may be made 1 or 2 days ahead and kept, wrapped in plastic wrap in the fridge. 1. Puree the frozen raspberries in a food processor. Press the puree through a fine-mesh strainer with the back of a spoon, removing the seeds. 2. Combine the puree, sugar, lemon zest, lemon juice, framboise & cornstarch in a saucepan and bring to a boil over a medium heat. Stir constantly. As it boils, it will thicken. 3. Transfer the raspberry filling to a bowl and let it cool completely at room temperature. 4. The raspberry filling can be made 1 day ahead and kept, wrapped in plastic wrap in the fridge. 1. Combine dark and semisweet chocolate in a metal bowl. In a small saucepan bring cream, vanilla, salt and icing sugar to a boil over moderately low heat, whisking until sugar is dissolved. 2. Remove pan from heat and add to the chocolate. Let the mixture stand for one minute. Whisk until chocolate/cream is melted & combined. 3. Cut butter into pieces and add to frosting, whisking until smooth. 5. Allow the ganache cool, stirring occasionally, until spreadable. 1. With a long serrated knife, trim the tops of the cakes and slice eat cake into two layers. Lay the bottom layer on cake stand. 3. Lay the next layer on top. Spread another 1/3 of the raspberry filling and top with more fresh raspberries. 4. Place the third layer on cake and the last of the raspberry filling and top with more fresh raspberries. Put the final layer on the top of the cake. Gently make sure that all the layers line up. 5. Pour some of the ganache in the middle of the top layer and with an offset spatula start smoothing out the frosting - gently pushing it toward the edge. Add more ganache until you have worked the ganache down over the sides of the cake. 6. 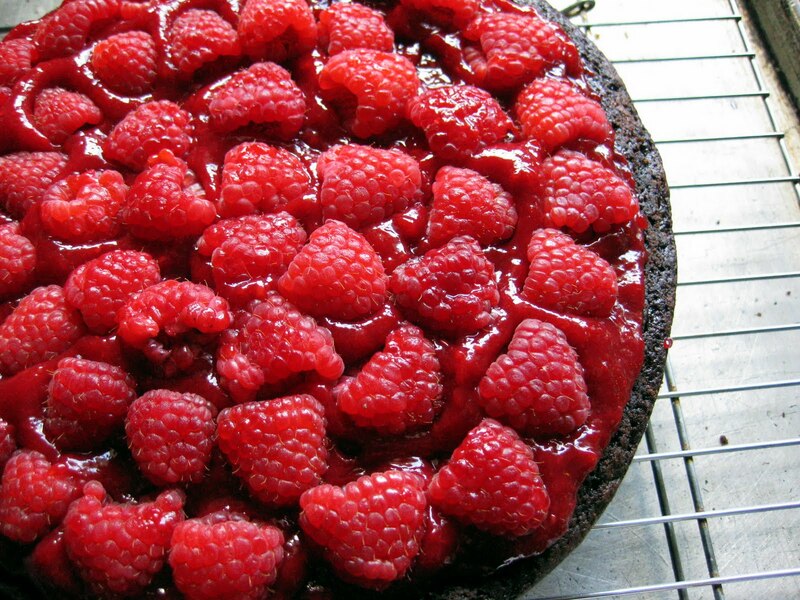 Garnish the cake with any remaining fresh raspberries. Folks, this is a show-stopper cake that wowed a party of dozens. Make it for a birthday, make it for an anniversary or just make it! Ah, the life of a foodblogger. People think you're a sad nofriendo when you bake your own birthday cake, but that's not it at all! Happy Birthday! The cake looks heavenly! Once again happy birthday Paula! !I have been drooling over this cake since I saw it on Facebook. To me raspberries and chocolate are a match made in heaven! I love love love this cake! 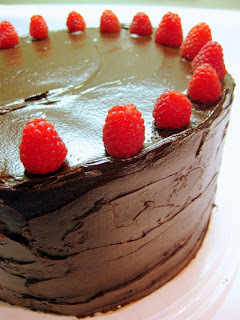 I love the layer of raspberries which are perfect with chocolate and the whole thing is stunning! A happy birthday to you (and guaranteed by this cake!)! look at all the raspberries! what a beautiful cake!